With Easter just around the corner, doing a project in the name of this holiday is a must! There are hundreds of ideas on what to do – from treat bags and treat cups, to Easter trees and wreaths. This period is really a heaven for every DIY lover, because there’s so much to do. That’s why we prepared ten amazing DIY projects for this Easter and we are pretty sure you are going to love them! They are easy, simple, yet so charming and adorable. You can even do them together with your kids. This is also a great opportunity to add a new decor in your home. Have fun! Aren’t these cups soo adorable? We love them! In order to make them, you need white, blue, orange and yellow cups, black sharpie, small and medium sized pom poms, scissors, ribbon or twine, colored cardstock or construction paper, cellophane bags and glue sticks. It’s really easy – use the sharpie to draw eyes and smile, the pom poms as animal’s nose, cut the cardstock to make rabbit ears, chick and bird feet, carrot stem and in the end, just glue them where they belong. 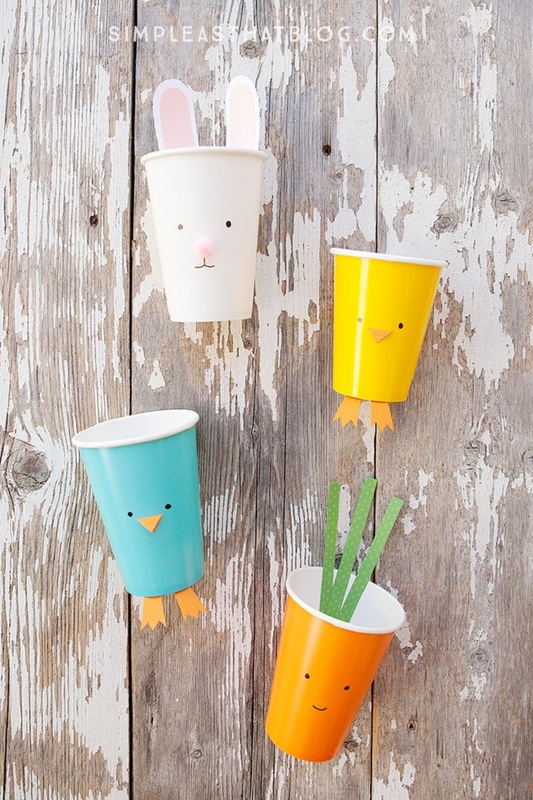 You can fill the cups with candies or just keep them like that – they look cute anyway. Clay time! Buy air dry clay, white acrylic craft paint, rolling pin, black oil – based sharpie, paint brush, glass bowls and sandpaper. On a smooth surface roll the clay to thickness of 1/4 inch. Place the top side of the bowl down to the clay and cut around the edges with knife. Use the rest to make the bunny ears. Press the round clay and the clay ears in the glass bowl and leave them to dry overnight. After that paint them white, or in any color you like, let it dry too, and then draw the face. Who said that decorating trees is only a Christmas thing?! Easter trees are fun as well. 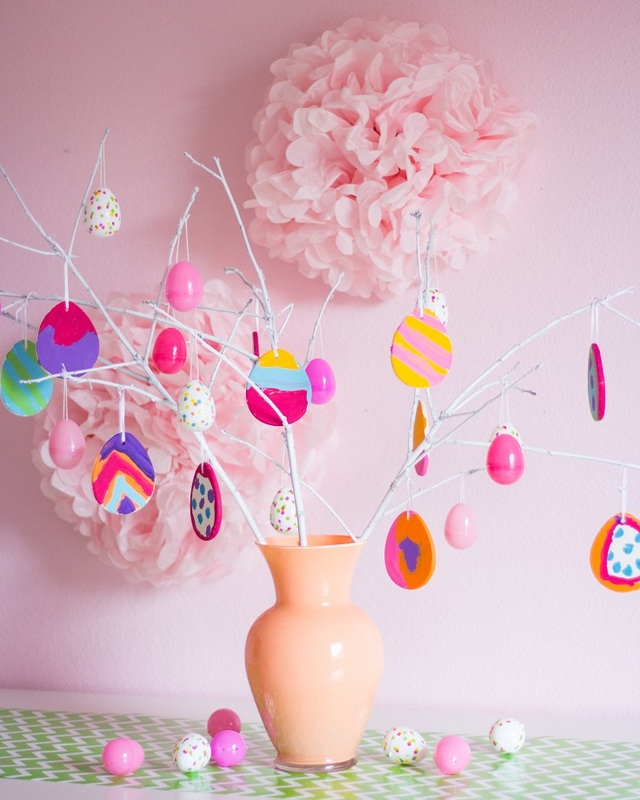 To have your own, make sure you have ceramic Easter egg ornaments, acrylic paint in more colors, small paint brushes, confetti plastic Easter eggs, pink plastic Easter eggs, tree branch, vase and spray paint, which is optional. Start by painting the egg ornaments and let them dry. In the meantime, find tree branches and if you want to, cover them with white spray paint. Place them in vase and start hanging the ornaments. It looks so cute! The great thing about these cute, mini baskets is that the website offers free printables – that’s how you get the polka dots! To download them, just click on the link under the picture. Besides this, you need glue or double sided tape, grass for Easter baskets, Easter treats, Easter tags and string. Print out the printables and cut the pieces. Fold them into a cube and glue them in a way that the polka dot pattern is on the outside. Use tape or glue to secure the walls and to insert the handle on the inside. The website offers free tags, so feel free to download them as well and attach them to the handle with string. 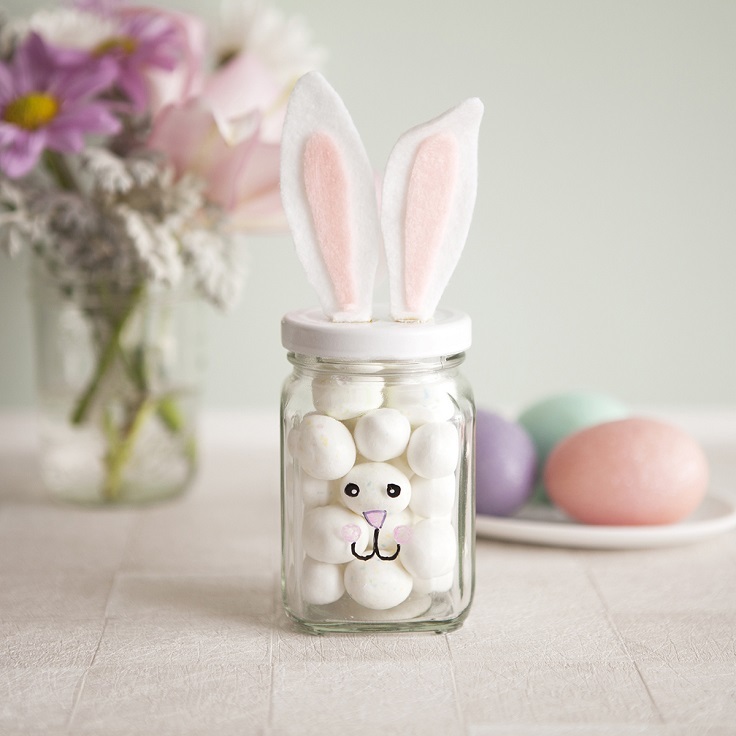 How cute is this jar with bunny ears? If you share our opinion that is super cute, then here’s what you need – a jar with lid, preferably a white one, white and pink felt, acrylic paints, paint brush, scissors and coated chocolate eggs. 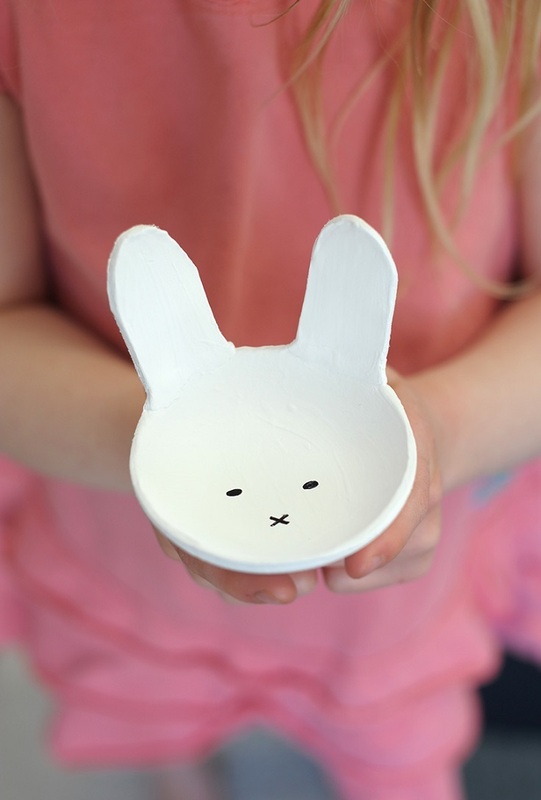 If your jar’s lid isn’t white, then use white acrylic paint and paint it, after that draw bunny face on the jar and let them dry. Cut out bigger white and smaller pink felts and glue them to make the ears. Fill the jar with chocolate candy and use glue gun to attach the ears to the lid. That’s it! 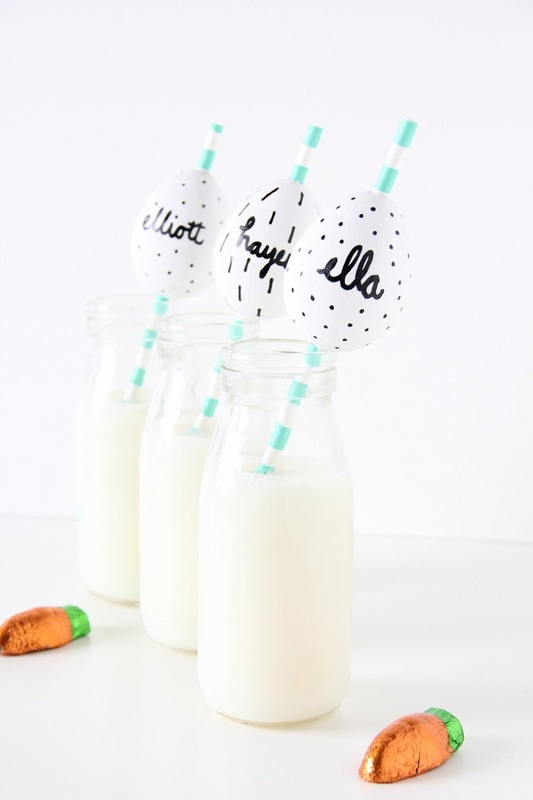 Perfect for Easter parties and gatherings, these egg straws will definitely fit to the holiday. You need paper mache eggs, drill, acrylic paint, brush and marker. You’ll need the drill to make small holes at the top and bottom of the egg, just enough that the straw would fit without the egg falling down. After this, you can paint the eggs in any colors that you want. Keeping them simple and white, but with marker decorations, such as polka dots or stripes. Prepare a delicious beverage, buy adorable straws and place the eggs. 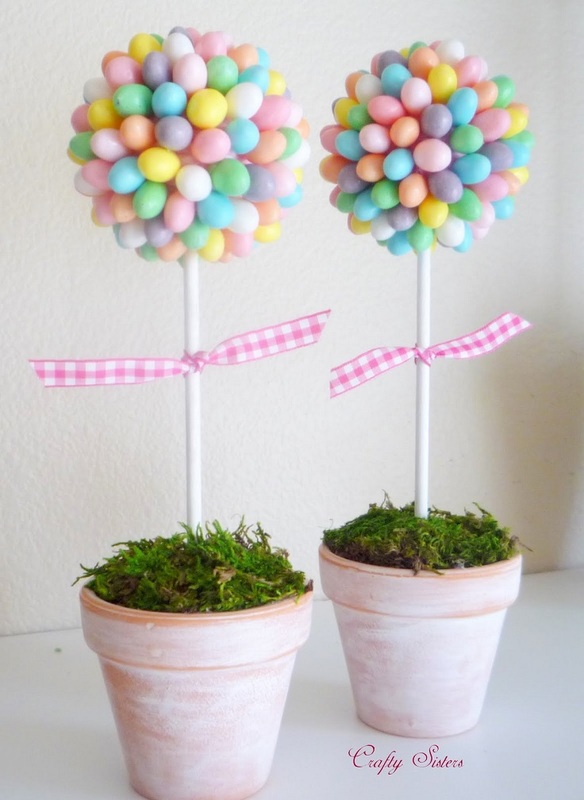 Easy craft that will turn out as a great home and Easter decor at the same time. Buy jellybeans and each of them glue on a painted styrofoam ball. Stick dowel inside the foam ball in order to stay secured, and also stick them in a small piece of foam to stand still as well. Place that in a pot, that you can also previously paint, and cover it with moss. To mate it even more adorable, you can take a ribbon and tie a bow around the dowel. This is a very lovely and easy DIY project, for which you need only three materials – yarn, scissors, baskets or buckets. Use yarn in different colors and make a fringe. 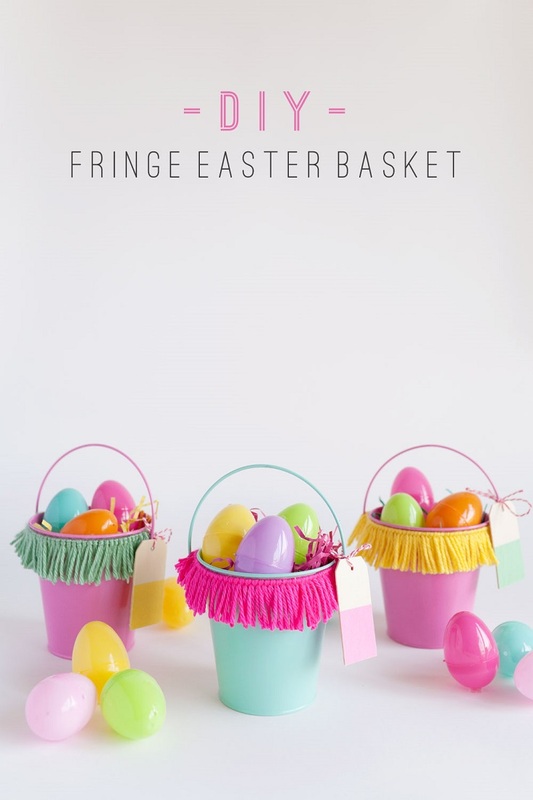 When you’re done, tie around your basket or bucket or glue it if you feel that way the fringe would be more secured. Use scissors to trim to get the desired fringe length. The last step is filling with Easter candies and that just it. The hanging eggshells is a great project if you want to add up something new in just few minutes. Who would thought that eggshells can be that useful? Take few of them, wash them carefully without breaking them in smaller pieces. When they’re dry, tape a thread inside, so that you can hang them later. This is it! 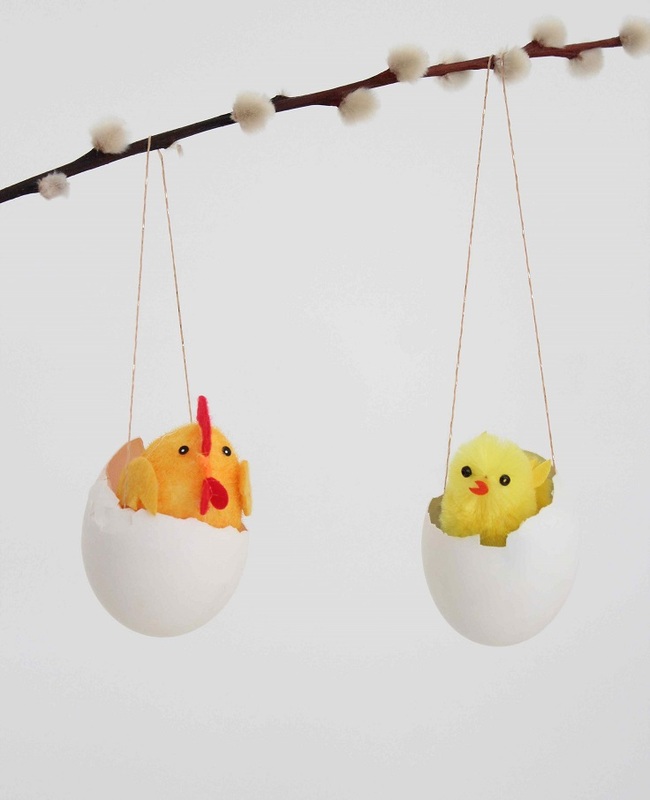 Just place an Easter chick inside and you have your own Easter decoration. It’s a perfect decoration for an Easter tree as well. This might be a little bit more difficult than the previous projects, but we totally recommend it as much as the others! 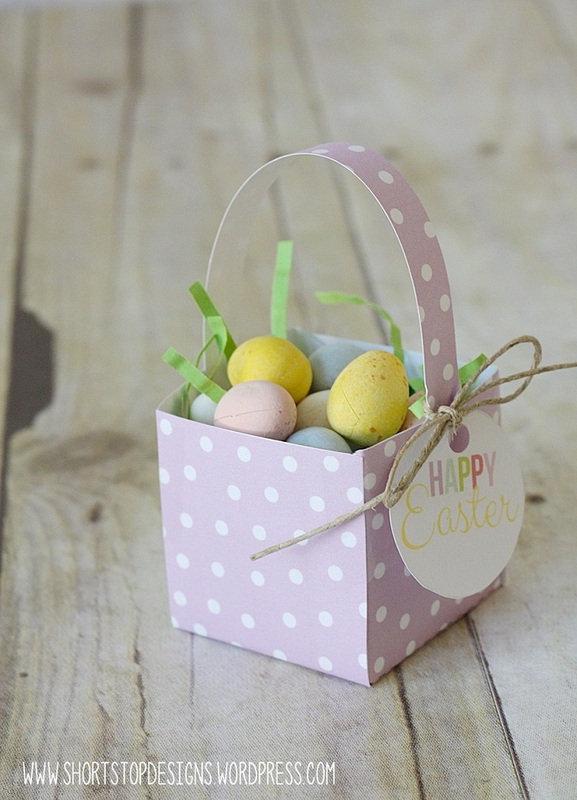 Make sure you have yarn, white felt, blue embroidery thread and needle, fabric scraps, baker’s twine, mini Easter eggs, hot glue, jute and wreath form. Wrap the wreath in jute, cut out two bunny silhouettes from felt and sew them with blank stitch. Create pom poms with the yarn, or use store – bought. 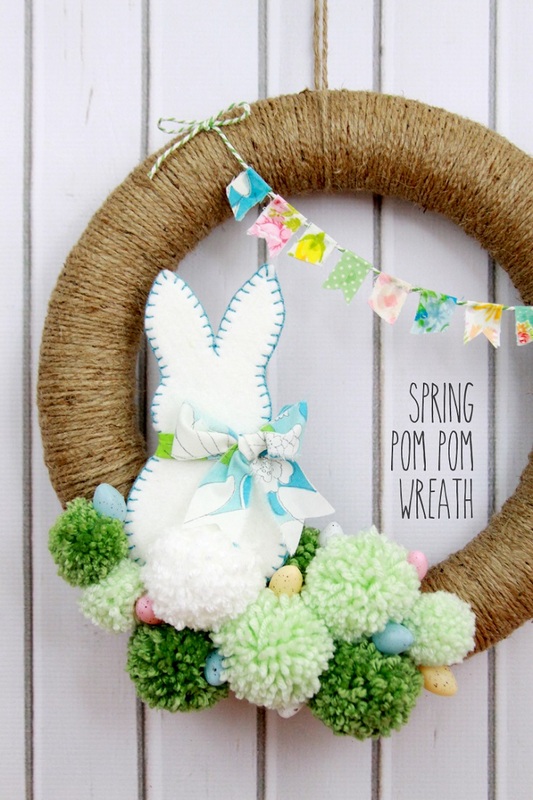 Glue the bunny, the eggs and the pom poms on the wreath.